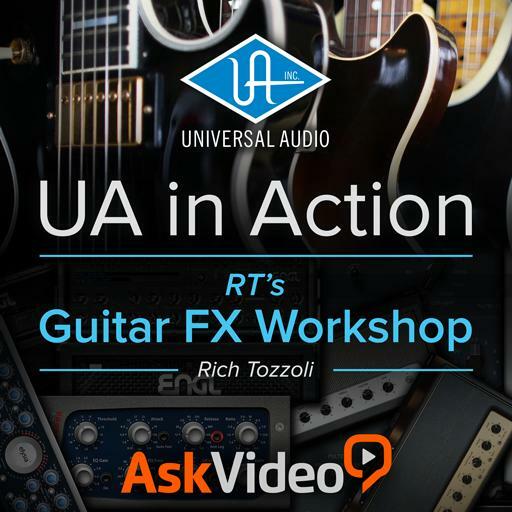 Universal Audio 102 - UA In Action – RT's Guitar FX Workshop. Which of the following distortion plugin features a Filter control? On the Tonelux Tilt plugin, what happens if you turn the Tilt knob to the right? The EP-34 is a simulation of what kind of hardware? When using the Ibanez Tube Screamer plugin, how can you blend the unprocessed signal with the distorted sound? Which of the following plugin is a good choice to bring out the pick attack on a guitar track? What type of EQ is the API 560? It's always best to compress tube amps and distorted guitars. True or false? Which frequency should you boost to add brightness to a guitar sound? When mixing multi-tracked guitars, you should make sure that all channels sound great on their own. True or false? Which of the following plugin is good to prevent clipping? When using reverb, what's a good trick to clean up the track? Resonator guitars are often identified with ______ music.